We are the well reputed company involved in offering best series of Simple Wooden Bird House. These are highly praised among our customers for its beautiful design and are accessible in different sizes. This product is fabricated by our adept workers using high grade material. Our mentioned products are very affordably priced. Our bird houses are the easiest way to bring delight in the garden. These bird houses have proper ventilation. This wooden bird house is made from recycled or scrap wood by skilled artisians from Jodhpur, Rajasthan. The wood is used in such a manner that it retains its orignal colors even after final finishing of the product and makes each piece unique. 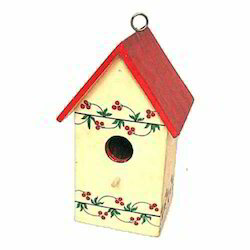 We offer a great range of Wooden Birdhouses and Birdfeeder. 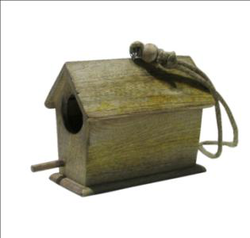 With our vast experience as manufacturer and exporter of fine quality of wooden handicrafts, and gifts, we are pleased to offer this fine quality of Wooden Birdhouse. These Charming birdhouses are a joy to children and add extra attraction to the backyard of any house. We are offering Printed Bird House to our client. Specifications:Widely demanded in at hotels, bird centuries, etc. We are a leading organization, engaged in offering a wide assortment of Handcrafted Sparrow Home. We make designer bird houses. The size depends on the buyer. Bird house made by wood.